Legacy Builder: Fred Seely put his mark on Asheville with the Grove Park Inn, his mountainside castle, and other landmarks. First Family: The Seelys, gathered next to a fittingly grand Christmas tree in one of Overlook’s great rooms, lived at the castle until the early 1940s. From its perch on Sunset Mountain, the castle offers stunning vistas in several directions. Overlook’s expansive great room features a 32-foot ceiling. Stone Sentinel: Seely began construction of the 20,000-squre-foot castle in 1914, and it took nearly a decade to complete. Reading & Relaxation: The sunlit library featured additional bookshelves on an upper balcony. Curiously, a door is rumored to be hidden behind the fireplace in this room. Seely welcomed many notables to Overlook. In this photo, taken in 1918 at the Grove Park Inn, he was joined by (from left) Harvey Firestone Sr., Thomas Edison, Harvey Firestone Jr., Horatio Seymour, and Henry Ford. Higher education: From 1949 to 1961, Overlook served as the campus for Asheville-Biltmore College, predecessor to the University of North Carolina at Asheville. As the old saying goes, “A man’s home is his castle.” Fred Seely’s certainly was. In 1913, Seely completed the biggest endeavor of his life: the construction of Asheville’s famed Grove Park Inn, which his father-in-law, pharmaceutical magnate E.W. Grove, had tasked him with building. The following year, Seely broke ground on another remarkable stone structure—a castle that would serve first as his family’s home and later fulfill a variety of unexpected uses. Then in his early 40s, Seely, a New Jersey native, had already had a momentous career as an architect, businessman, chemist, hotelier, and newspaper editor. In gratitude for his work on the Grove Park Inn, Grove gave Seely a 29-acre tract on the crest of nearby Sunset Mountain—the site of a former casino and picnicking spot that featured commanding views in several directions. Seely, an Anglophile who’d rubbed shoulders with northern blue bloods for much of his life, set out to build a home as spectacular as the inn he’d just completed. He crafted a design for a castle in the English Gothic style, one loosely inspired by a London-area monastery that Seely fancied, and gathered granite from the same local quarries that supplied the Grove Park Inn’s hulking stones. 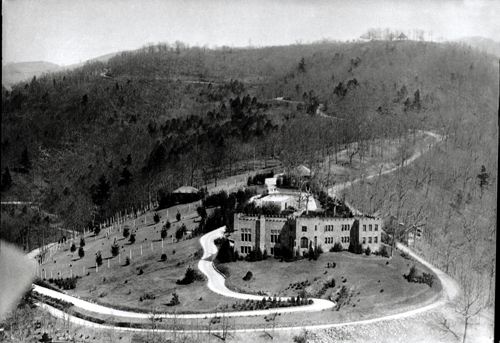 The 20,000-square-foot castle, which Seely christened Overlook, took a decade to complete, though he, his wife, and five children moved in by about 1916, when it was still a work-in-progress. Once completed, it was a mountain-area marvel, rivaled only by the Biltmore House for its extravagance. A huge structure with multiple wings, towers, and parapets, its windows were filled with stained glass and its great rooms with massive fireplaces. One of the fireplaces was laced with European history, including stones from the Tower of London and Blarney Castle. The early electrical work was designed by no less than Thomas Edison. The grounds were sculpted with equal fastidiousness, highlighted by a fishpond, fountains, a deer park, rose garden, greenhouse, and manicured drives and courtyards. Overlook quickly drew a crowd befitting its grandeur. In addition to much of Asheville’s 1920s-era high society, five U.S. presidents visited, including Coolidge, Harding, Hoover, Franklin Roosevelt, and Wilson. Harding even took his cabinet there for a heated retreat during the Teapot Dome Scandal. Titans of industry, including Edison, Harvey Firestone, and Henry Ford were also hosted. From his castle home, Seely remained an industrious mover and shaker until his death in 1942. His widow, Evelyn Grove Seely, then decamped to the Battery Park Hotel in downtown Asheville. In 1949, she sold Overlook to Asheville-Biltmore College, predecessor to the University of North Carolina at Asheville, for a mere $125,000. She donated $50,000 of that sum to assist the purchase. So began the castle’s second act. As noted in a printed program from when the college was dedicated, local undergrads would now study in a “setting of great natural beauty,” inside the newly renamed Seely Hall. The extraordinary situation, which took the notion of higher learning to a lofty new level, lasted until 1961, when the college outgrew the locale and moved to its present campus in north Asheville. A development company purchased the castle, though it languished for the next four years. In 1965, Jerry Sternberg, a local businessman and raconteur with deep roots in the community, purchased Overlook for just $40,000 and moved in with his family. The castle was slipping into a state of dilapidation, but the Sternbergs spiffed it back up and let the good times roll in regal fashion. Throughout the family’s stay, the roof leaked, and it was mighty hard to heat the place. But the Sternbergs opened their home for many grand gatherings, including one that featured a visit from Yitzhak Rabin, then an Israeli general and later the country’s prime minister. In 1976, the Sternbergs donated the castle to a religious group, and Overlook Christian Ministries was born. For several years, an evangelical preacher and his family lived in the castle, and in 1980 they helped add the structure to the National Register of Historic Places.